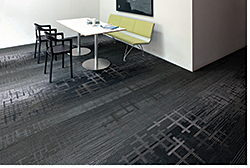 The Change Collection is available in modular and Powerbond, a hybrid resilient sheet flooring. The solution-dyed Dynex SD nylon flooring is inspired by the interplay of imagery that occurs on the manufacturing line when one style is transitioned to the next. Three styles provide various pattern, scale and coordination options in 12 multi-colors.